What Is Causing Your Excessive Sweating? If you’re always sweating, you might be wondering why it’s happening to you. You notice that you have heavy sweating even when you’re sitting still in a cold room. Your friends and family don’t sweat like that. So, what’s the cause of excessive sweating for you? Well, it could be one of the following health conditions. As scary as it sounds, some cancers could be the cause of excessive sweating. The types of cancers potentially causing the constant sweating include Non-Hodgkin’s lymphoma and Hodgkin’s lymphoma, carcinoid tumors, leukemia, mesothelioma, bone cancer, and liver cancer. Many doctors don’t fully understand why some cancers are the cause of excessive sweating, but it might be connected to the body trying to fight off cancer. Hyperhidrosis is a very common cause of excessive sweating. In fact, there are eight million Americans with hyperhidrosis, and they sweat four to five times as much as the average person. This sweating condition is broken into two subtypes, either primary or secondary hyperhidrosis. Primary hyperhidrosis doesn’t have a clear cause, but it is thought to be hereditary. Secondary hyperhidrosis is typically caused by other medical conditions and medications. Some medications can cause people to sweat excessively. Medications for high blood pressure, psychiatric drugs, medicines used to treat dry mouth, and some antibiotics and supplements can all cause excessive sweating. If you think your medication is causing you to sweat excessively, then you need to consult your doctor. Glucose control disorder includes diabetes type 1 and type 2, gestational diabetes and hypoglycaemia (abnormally low glucose levels). Excessive sweating is a symptom of having low glucose levels. Many women going through menopause report suffering from hot flashes. In fact, 75% of women say they experience hot flashes and sweat a lot during menopause and the time leading up to it. In some women, the hot flashes are so severe that they have to change their clothes. These hot flashes and sweating problems during menopause are thought to be caused by fluctuating estrogen levels. The cause of excessive sweating is often unknown for many suffering. Fortunately, though, a visit to your doctor can help you figure out why you’re sweating so much. Two Different Kinds of Hyperhidrosis: Which Do You Have? If you experience heavy sweating, constant sweating, or both, you might have a condition known as hyperhidrosis. It’s not a life-threatening diagnosis, but it is uncomfortable, embarrassing, and often psychologically traumatic. When you have hyperhidrosis, you will tend to sweat excessively. It typically develops in adolescence, and it affects millions of Americans. There are two main types of hyperhidrosis that cause heavy sweating, and they are primary idiopathic hyperhidrosis and secondary hyperhidrosis. Primary idiopathic hyperhidrosis is the most common cause of excessive sweating; it affects roughly 1% to 3% of the population. This type of hyperhidrosis tends to be localized, or focal, affecting specific areas of the body like the hands and feet. There is usually not a known cause for this type of hyperhidrosis. People used to think that primary hyperhidrosis was linked to the patient’s emotional and mental state. However, recent research suggests that people with primary hyperhidrosis are no more prone to feelings of nervousness, anxiety, or emotional stress than the rest of the population. Certain genes are thought to play a role in hyperhidrosis, so some experts think that it’s hereditary. The majority of patients with primary hyperhidrosis have a parent or sibling with the same diagnosis. Secondary hyperhidrosis occurs when a person experiences heavy sweating because of an underlying health condition, like menopause, obesity, gout, tumors, mercury poisoning, diabetes mellitus, or hyperthyroidism. This type of hyperhidrosis tends to be generalized, affecting the entire body. In order to be diagnosed with one type of hyperhidrosis over the other, your doctor will have to rule out any underlying conditions like low blood sugar or hyperthyroidism by ordering urine and blood tests. Then, you will be asked about the patterns of your sweating. When your doctor figures out the potential causes and severity of your condition, they will be able to provide you with a diagnosis. If you get diagnosed with hyperhidrosis, it’s important to know that you aren’t alone. There are many different treatment options so you can get your life back and control your heavy sweating. You sweat excessively, even when you’re sitting in an air-conditioned room. You have no idea why. It’s something you’ve been dealing with for a long time, and it’s starting to inhibit your life. Well, that excessive sweating problem might be a condition called hyperhidrosis. Here are some signs that that’s the case. There are many different things that are thought to cause hyperhidrosis in people. With that being said, roughly 30% to 50% of people diagnosed with hyperhidrosis have another family member afflicted as well, implying a genetic predisposition. This condition also has a higher incidence in people who are more prone to feelings of anxiety, nervousness, and emotional stress than the average person. While your life may seem doom and gloom because you sweat excessively, there is hope. There are many different treatment options available, including iontophoresis treatment. With this process, you use the equipment to immerse parts of your body in small tubs of water. Then, small electrical currents flow through the water, temporarily shutting down your sweat glands. You can use it for your feet, hands, arms, and more. It’s recommended that you complete this processes a few times a week for 15 minutes at a time. After you’ve been doing it for a few weeks, you can cut down to twice a week sessions. The best part about this treatment is that you can purchase the equipment yourself and do it right at home. Hyperhidrosis is hard to deal with, but there are solutions. You no longer have to avoid physical contact, working in public, or your favorite activities. Take your life back from hyperhidrosis and try iontophoresis treatment today. Are you always sweating? If you are, you might have hyperhidrosis. You also know that your constant sweating produces unappealing odors, and they can be hard to deal with. 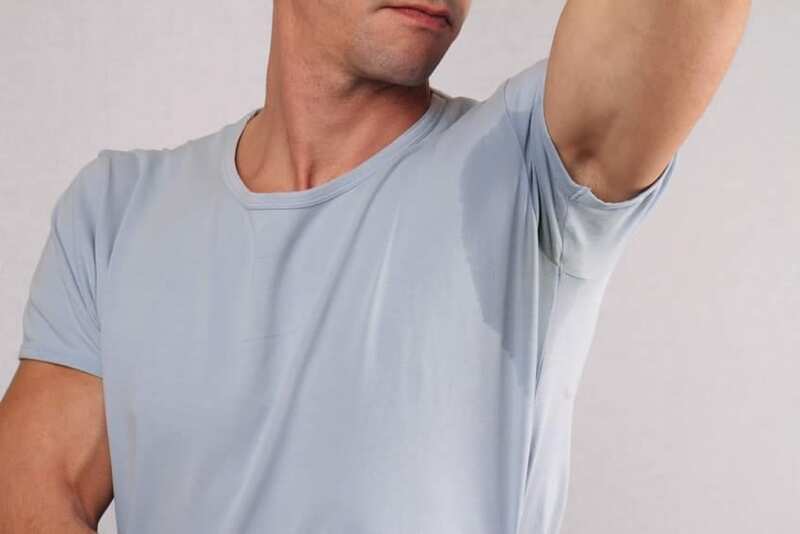 Here are some tricks you can try to control odor from excessive sweating. Most people know that your diet can affect your breath. If you eat a bunch of onions, everyone around you is going to know. Did you know, though, that what you eat can affect your body odor, too? Foods that are particularly smelly, like spicy foods, cause smelly bacteria to come out of your pores, which mix with your sweat. So, if you want to control odor from excessive sweating, avoid spicy, smelly foods. When your skin is dry, it’s harder for bacteria that causes body odor to breed. Make sure to thoroughly dry yourself off after a shower to help yourself out in the long run. This may sound odd, but applying apple cider vinegar right on your armpits after a shower can help you reduce your body odor. The vinegar lowers the pH levels of your skin, which reduces odor-causing bacteria. Natural fibers like cotton and linen are going to be your best friend if you sweat a lot. These fabrics are very breathable and will help you reduce your odor from sweating. Finally, you can try applying your antiperspirant before bed to control your odor from sweating. When you apply it before you go to sleep, it allows the product to work while you’re sleeping and not sweating. 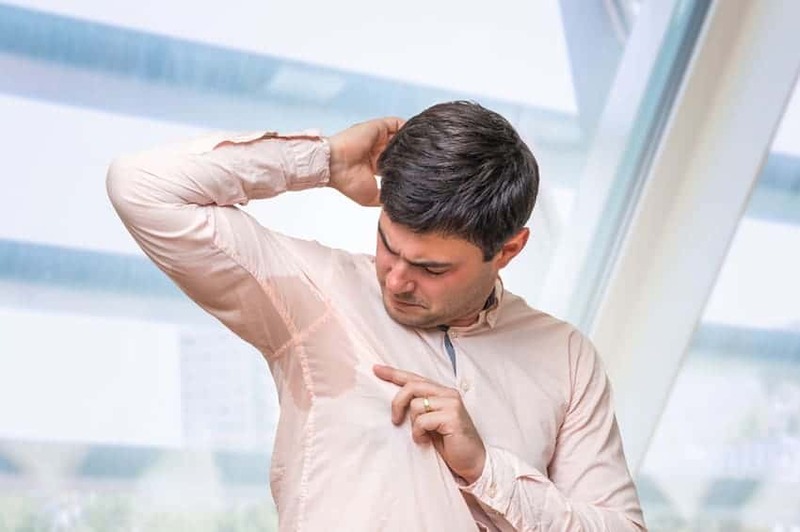 If you want to control odor from excessive sweating from hyperhidrosis, watch what you eat, dry off after a shower, apply apple cider vinegar, wear breathable fabrics, and apply an antiperspirant before bed. More than 90% of hyperhidrosis patients say that their condition affects their emotional state. According to a survey, most patients reported feeling less confident because of their condition. Don’t let your heavy sweating stop you from enjoying your life. Contact us today to talk about treatment options for hyperhidrosis. Do you notice that you’ve been sweating more than the average person? In fact, you’re sweating constantly, and you don’t know why. Well, here are just some of the reasons your body might be shifting into overdrive when it comes to sweat production. Life can be incredibly stressful at home or at work, and unfortunately, stress can lead to excessive sweating. Normally, when you’re hot, your sweat is produced by the eccrine glands all over your body to get rid of toxins and to cool you off. Stress sweat is different. When you’re stressed, your sweat is produced by the apocrine glands that are only found in certain areas like your armpits. This sweat contains fat and protein that mix with bacteria in your skin and produce a foul odor. Hyperthyroidism, or an overactive thyroid, might be the reason you’re sweating more than the average person. This issue means that your thyroid gland is in overdrive and is producing excess levels of the metabolic hormones thyroxine (T4) and tri-iodothyronine (T3). Your body’s systems all start to work incredibly hard as a reaction to a rise in these hormone levels, meaning you’re going to start sweating more. It’s important to see your doctor immediately if you think you’re having a thyroid problem. Primary Focal Hyperhidrosis is actually the most common cause of excessive sweating problems, and it affects 1% to 3% of the population, so it’s very likely that this is the reasons you’re sweating constantly. The theory behind why some people suffer from this sweating disorder is that it’s a genetically transferred problem in the nervous system. Fortunately, iontophoresis treatments exist so you can help control your constant sweating. Sweating constantly is no fun, and it can seriously diminish your self-esteem. If you think you might have a sweating problem, talk to your doctor today so you can figure out what’s causing it and start on the path to stop the sweat. If you’re always sweating, you probably have a condition called hyperhidrosis. You may feel hopeless as the excessive sweating is constantly causing embarrassment, discomfort, etc., but it’s important to know that you have options. Here are some things you can do to stop the sweat and get a handle on your excessive sweating. Spicey foods active the neurotransmitters in your brain that cause you to sweat more. A chemical found in spicy foods called capsaicin can trick your body into thinking it’s experiencing some sort of trauma, making you stress-sweat. It can also trigger a separate nerve ending that responds to mild warmth, leading your body to think that it’s too hot and produce sweat to cool you down. You might love that first cup of coffee every morning, but your sweat glands don’t. The caffeine in your cup of Joe stimulates your central nervous system, which activates your sweat glands. Additionally, the heat from the beverage itself can make you sweat. You don’t have to cut coffee out of your diet completely; try swapping a hot brew for an iced coffee once in a while. When you sweat a lot, breathable fabrics offering good ventilation will be your best friend. Get yourself some shirts, pants, undergarments, etc., made of breathable fabrics like cotton. You should also stick to lighter colors that reflect the sun rather than absorb it; they also don’t show the sweat marks as much. Really, the only sure-fire way to stop the sweat for good it to engage in iontophoresis treatments. They are safe, painless, and simple. You place parts of your body (like your feet or hands) in a tub of water that has a mild electric current running through it. The current is filled with ions that pass over your skin and temporarily close your sweat ducts. The treatment only takes about 15 minutes, and you only need to do it a few times a week to see amazing results. There are about eight million Americans living with hyperhidrosis, and they sweat four to five times more than the average individual. If you’re one of these people, you are not alone, and there are things you can do to stop the sweat. If you are ready to take the steps to get a handle on your hyperhidrosis, check out our inventory to get the necessary equipment you need to get your life back.